I wanted to share this beautiful video that I’ve found. The song talks about various girls in fiction who end up in fantasy worlds, and the video expands with some more “girls who save themselves” from movies. The song is actually be Seanan McGuire, author of Every Heart Is a Doorway which I’ve reviewed in a previous blog post. The book is about people who’ve ended up in magical worlds and it’s clear that the story and song fit well together. 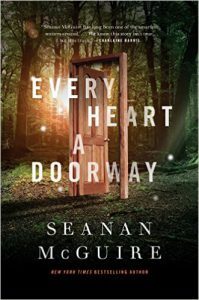 Every Heart a Doorway by Seanan McGuire is an original and interesting take on the classic fantasy concept of children stumbling into magical worlds. The protagonist, Nancy, has recently returned from the Halls of the Dead and she came home changed. Her parents, believing she was kidnapped, are concerned for her health and are convinced to send her to a special boarding school. To Nancy’s surprise, all the students (and some of the teachers) are people who have been on similar adventures to her, travelling to worlds of many different types. She meets students who fought goblins, danced with skeletons, or ran across rainbows. Here they can talk about their experiences and know they will be believed. But this sanctuary isn’t safe. When students start getting killed, Nancy finds herself one of the prime suspects. As a recent arrival and someone who lived among the dead, the other students are wary of her. If she is to win their trust, she must convince them that she isn’t the killer. All the while, she dreams of returning to her magical world. I really enjoyed this book. It’s a different take on a classic concept. The variety of magical worlds is hinted at and I loved the idea that there are people at this school treating the travel to these worlds like a science, trying to figure out how it all works and understand what it all means. The characters are interesting and each feels like a genuine person with their own personality traits, desires, and opinions. The style of the story is quite simple and makes for a pretty quick read, but that simplicity adds to the magic of the world. It feels a bit like hearing a fairytale in places. From a diversity standpoint, it does well. The protagonist is asexual and this is clearly addressed – as well as being a reason for the isolation she felt that led her to find her magical world. Her sexuality added to her character and never felt stereotyped or disrespectful. There is another character in the story who is trans, which is again treated in a respectful way by the narative (though there are incidents of transphobic language from another character). On the whole, I highly recommend this book. It’s a simple read but well worth it. Five stars.